The U.S. Mint at noon ET today, Oct. 11, releases the much-anticipated 2016 Ronald Reagan Coin & Chronicles Set. 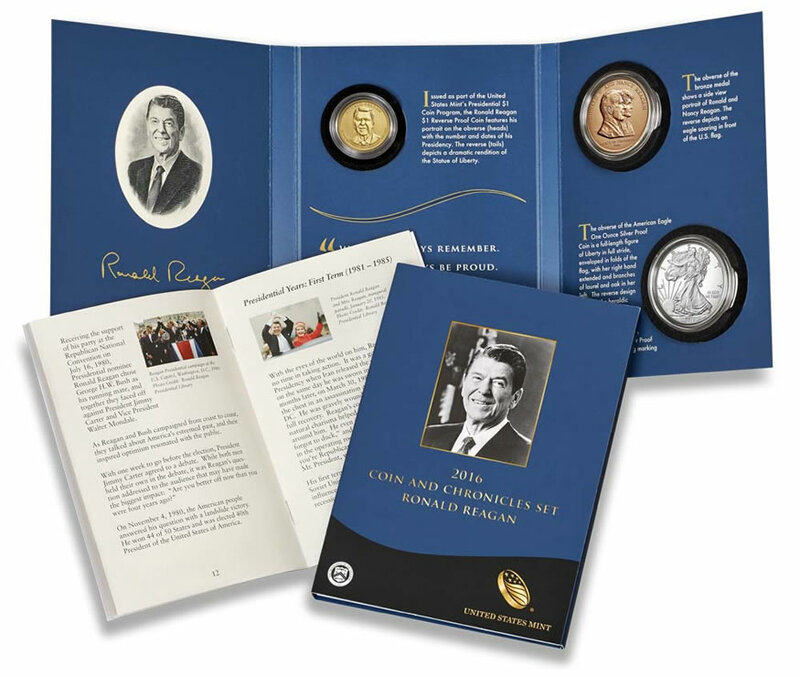 Honoring the 40th President of the United States with an engraving, medal and coins featuring Reagan, this set serves as the last issue in its series. Pricing at $68.95 is more than past sets, owing mostly to the inclusion of a higher priced coin. Unlike prior sets, this one doesn’t include a silver medal. However, and also unlike them, it has a proof Silver Eagle that sells by itself for $53.95. The Liberty Coin Act explains its presence in the set. The act authorized the series of American Silver Eagles and Reagan signed it into law on July 9, 1985. Of note, this year’s proof Silver Eagle sports edge lettering of "30th ANNIVERSARY." One 2016 Reverse Proof Reagan Presidential $1 Coin with a ‘S’ mint mark. One 30th Anniversary 2016 Proof American Silver Eagle with a ‘W’ mint mark. One Ronald and Nancy Reagan 1 1/2-inch Bronze Congressional Medal. One authentic engraved Ronald Reagan Presidential portrait produced by the Bureau of Engraving and Printing. One booklet including images from Reagan’s life and presidency. Adding to its appeal, the reverse proof is exclusive to the set. Many coin collectors will buy the set just to get the dollar. The United States Mint’s online product page for the set is right here. Place phone orders using 1-800-USA-MINT (872-6468). No more than 150,000 will be sold, with ordering limited to three per household. All items are displayed in a soft-touch blue folder and accompanied by a Certificate of Authenticity. Update: First-day sales reached 21,511 sets. 150,000 sets! A nice set, but the JFK C&C set last year was limited to 50,000 sets & took awhile to sell out. Any guesses on how many weeks, or months it takes this one to sell out? I wouldn’t be too surprised , if this set doesn’t sell out somewhat rather quickly, considering how popular Reagan was, and still is for that matter. With the 30 year anniversary proof eagle coin, along with 3 sets per household ; it should be interesting ! Nevertheless, I will be buying my 3 sets at 11 am sharp, central time! I’ll be purchasing 3 sets tomorrow as well, though I’m sad to see so many sets being produced this time. 50,000 seems like more than enough. From my perspective, the fewer the better as it makes them that much more valuable. I’ll never understand why the Mint does what it does! I have purchased all the previous C & C sets but I will not be purchasing this one. 150,000 sets is excessive. The mint is just being greedy. 50,000 sets is a reasonable amount and would give the sets some future value. I believe these sets will not sell out for many months if ever. I so glad the Mint produced 150,000 so now I can order for 1 set for my collection. I bought 3. It was as easy as Amazon. Demand will be bad for this one. On ebay, five 2016 Reagan Coin & Chronicles Sets have sold presale each for $85.95 + $9.85 shipping as item #232090252478 from seller nanabevvs on September 30, 2016. Another 3 sets sold presale each for $129.95 with free shipping as item #152246722799 from f.w.traders on October 1, 2016. The irony is that these sets can now be ordered directly from the U.S. Mint for $68.95 + $4.95 shipping. Eddie, I’m like you, it takes a large number minted so individuals can get one for their collection. I’m so tired of seeing late night TV Coin rip off people with hundreds of mint specials and I couldn’t get one measly Coin for my collection. If this set doesn’t ever sell for more than what I paid for it, I don’t care. It’s greed that’s hurting the hobby of Coin collecting. My collection goes to a grand daughter and perhaps on her children. I signed on to the Mint Site at eleven o’clock, placed my order all in roughly 30 seconds this morning. Glad you got your sets. I got mine too without website computer problems. I even called the customer service phone number after placing my website order & the phone lines were not busy! Nice set for sure, but a very high mintage of 150,000 sets will keep the true secondary market prices low (not the tv shopping shows high prices though!). any word on the mintage for the Walking liberty half and Limits ? Some complain when the US Mint allows coin wholesalers and dealers to buy 10 coins/sets, but this set and the gold standing liberty quarter are examples of what happens when purchases are limited (or mintages are too high). Wholesalers and dealers play a part by providing liquidity. Note: I am not a wholesaler or dealer nor do I have any relationship with one. Where do you find how many sets have sold so far? As a test, I logged into the US Mint website at noon via my phone (which I have never done before) to see how difficult or easy it would be to place an order. First I placed an order for two of the sets and I was done in thirty seconds. Then I placed an order for one more a minute after my first order and it went just as smooth. So evidently there was no mad rush to purchase these sets. This now completes my collection for all of the Coin & Chronicles sets. Does anyone have any insight if the mint has one or two of these Gräbener presses being utilized in striking of the Tributes? And does the W mint typically work a standard 8 hour work day or dual shift? Maybe this set will have low sales and then ironically become valuable. Hmm. It sure would make it easy if the US Mint only pumped out highly desirable coins in very limited numbers. I would never need to even open the box of what I’m collecting. The mint should just have an option to ship directly to EBay buyers so I don’t even need to see the box. It would make the best collection I never even received. I guess the US Mint can just continue offering a veritable cornucopia of combinations so there is something for everyone. I sometimes wonder if there are many true collectors anymore. Most who post, all they talk about is secondary market, flipping, e bay, mintages, and on and on. Very few talk about how nice the coin actually is and how happy they are to add it to their collection. Shame the way the hobby has gotten. I wonder whose fault that is? Sales on the first day totaled 21,511 sets. Very low first day sales of only 21,511 sets out of the 150,000 sets mintage! Like I posted the other day, it may take until next year to sell out if it ever does. I ordered 3 sets – 1 for my collection & 1 each for my two nephews for their collections. Will not order anymore of these nice, but common sets for sure. Wow, only 21,511 sets sold on Day 1. Easy in and out ordering. Status is shown as shipped. Wish it was always this smooth. Was going to pass but decided on ordering since it was $15 over the silver eagle proof by itself. With the additional reverse proof $1, bronze medal, and being the Reagan set it seemed fairly priced. I would have preferred a Reagan one ounce silver coin but the 30th anniversary eagle is ok. I needed the Ronald Reagan “Coin & Chronicles” set to complete my collection. In my humble opinion, the addition of the Silver Eagle Coin makes it a very cool set. My 3 sets are listed as shipped also. Very fast service since they didn’t have many orders to fill today with a limit of 3 sets per address & only 21,511 sets sold on first day of issue! Amazing low demand for an historic set due to ultra-high mintage of 150,000 sets. At least there were no problems with ordering this time. For me to be able to place my orders via my phone in my work parking lot says it all. Glad you were able to complete your C&C sets collection. I haven’t downloaded the Mint’s mobile app for my Android smartphone yet. Good to know it is an option that worked good for you with wi-fi in your work parking lot. I still need to get the 2005 Chief Justice John Marshall C&C set to complete my collection (I don’t know how I missed getting that one back then, but noticed it isn’t checked off on my inventory list). 150,000 IS WAY TOO MUCH! But I will still get some to go with the others I have. I have four grandkids so I try to get four of everything if I can. Grandkids can get expensive. I understand exactly what you mean! I have four nephews (two in college & 2 in elementary school) & I try to buy them as much as I can. The 2 older ones get a gold coin each year & special sets like this one & the 2 younger ones get basic Proof & Mint sets & a Proof ASE coin each year & a commemorative clad half dollar or Young Collector’s Sets when they are offered. The Mint’s Coin Discovery Set from 2014 for beginners is a great gift for the kids at only $24.95 & is still available. I also own two of the “2014 Coin Discovery Sets” that you mentioned. Nice little set for the price. That’s a great idea! I’m going to get the sets you mention for my younger Grandkids. But my second youngest really gets into NASCAR. He is 13 and can tell you the number of any driver, his name, the model of the car and on and on for each year going back maybe 4-5 years or maybe more. He has a mild form of autism. I say mild because nobody even knew till this year and the Dr. said it was not serious. That is why is into NASCAR. He actually has a thing with numbers. I now just have to turn his interest to numismatic numbers. I am so proud of him it’s unreal. Good luck & Happy Collecting to you & your grandkids! Thanks for the tip on the NASCAR Medal. I will text my Grandson the photo from mint.ca. I’m sure he will love that. And that might be the key to get him started. And also the Red Book. I just wish he lived closer to us. He is about 470 miles away. But we do keep in touch by text and Facebook. And what he wants he gets. But that is the way it is for all four of my Grandkids, two boys and two girls. They all make me very happy and proud. And they tell me they feel very lucky to have me as a Grandpa but… I AM THE LUCKY ONE FOR SURE!! And I think your nephews are lucky to have you as their Uncle! I think the sales might pick up after some of the silver eagle collectors notice how much a 2016 30th anniversary PCGS first strike dcam pr with a Ronald Reagan Chronicles Set label will sale for, and more if it’s signed by Mercanti. I think the next leg up in sales for the set may be from silver eagle collectors. Eddy, that was fast, but not unexpected. As of October 16 the US Mint show sales for 2016 REAGAN COIN & CHRONICLES SET at 24,893.